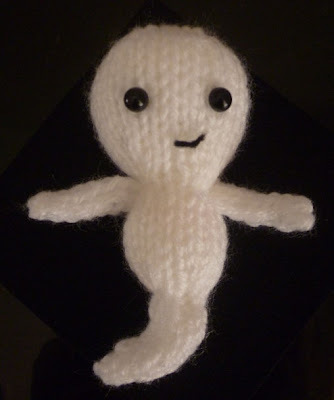 Free Halloween Ghost Toy Knitting Pattern by Raynor Gellatly. Spooky greetings my fellow knitters! Can you believe it's October already? To celebrate one of the biggest holidays of the year I've made this little ghost. He is quite small so I'm not sure what he is exactly, a little gift fot trick or treaters, tiny baby toy, part of a halloween costume or perhaps even a little decoration for a Halloween display. Whatever you chose to make him for I'm sure you'll agree he is far too cute to be scary, but he tries his best. Remember to post you finished toy pictures to the flickr group or to your projects on Ravelry because I just love seeing how other peoples toys turn out. Cut yarn, leaving a long tail. Draw tail through remaining stitches and pull tightly and secure. Use tail to mattress stitch row ends closed stopping halfway to add eyes and embroider on a mouth and fill with stuffing. Close remaining opening and secure any loose yarn ends or create a loop if using as a decoration. Cut a long yarn tail and draw it through the remaining stitches,leave the remaining yarn tail to attach arms to body. He's adorable. What a great Halloween project. What a cute ghost! 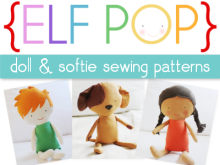 I'm the editor of AllFreeKnitting.com and I would love to add a link to this little guy on our site. Would this be all right with you? 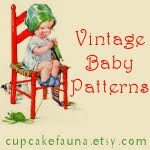 We also feature pictures of patterns we link to in our newsletters. All credit and links would go directly to you and your site. Really cute!! 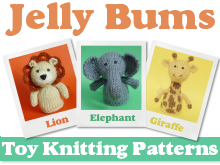 Thanks so much for sharing your adorable pattern! Sososososososooososososo CUTE!!! Every time I look down at him (mines called Bobby) I feel very happy! I can never find patterns that match my ability but this was perfect!